How to use Galaxy Note 9 S Pen? How to use S Pen remote control on Galaxy Note 9? How to change Galaxy Note 9 S Pen nib? How to disable Galaxy Note 7 Flipboard briefing? How to access and use Galaxy Note 7 notification panel? How to manage and use Galaxy Note 7 quick setting buttons? How to take screenshot on Galaxy Note 5 without using any apps? How to use Galaxy Note 5 screen off memo? How to disable flipboard briefing on Galaxy Note 5? How to use Galaxy Note 5 apps screen? How to use Galaxy Note 5 lock screen? How to use app folders on Galaxy Note 5 home screen? How to use Galaxy Note 5 notification panel? How to use Galaxy Note 5 quick settings? How to add app shortcuts to Galaxy Note 5 air command? How to use scroll capture in Galaxy Note 5? How to use Galaxy Note 5 themes? How to unhide and access Galaxy Note 5 developer options? and how to hide Galaxy Note 5 developer options? How to take photos continuously without reviewing the photos on Galaxy Note 4? How to use volume button to take photos in Galaxy Note 4? How to use voice commands to take photos and record videos on Galaxy Note 4? How to manage and download Galaxy Note 4 camera effects? How to set storage location for Galaxy Note 4 camera? How to use Galaxy Note 4 camera burst mode? How to customize Galaxy Note 4 camera app interface (and shortcut menu)? How to set picture size and video size for Galaxy Note 4 camera? How to use Galaxy Note 4 video recording modes? How to manage and download Galaxy Note 4 camera modes? How to take a screenshot on Galaxy Note 4? How to turn off/on the touch key light (return and recent) on Galaxy Note 4? How to access Galaxy Note 4 hardware menu button? How to turn off Flipboard briefing on Galaxy Note 4 home screen? 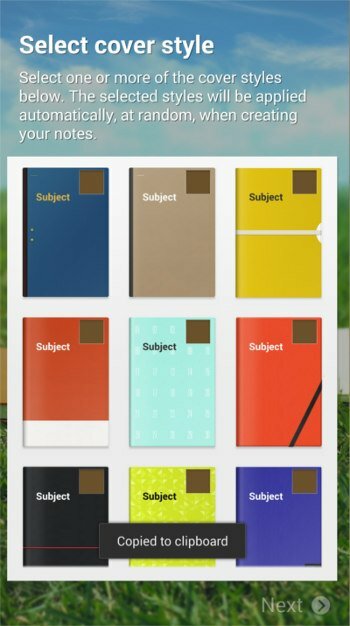 How to create app folders on Galaxy Note 4 home screen and app drawer? How to add widgets to Galaxy Note 4 home screen? How to customize Galaxy Note 4 ringtones? How to use Galaxy Note 4 download booster? How to create own vibration patterns on Galaxy Note 4? How to use Galaxy Note 4 finger scanner? How to silence Galaxy Note 4? How to install S Note idea sketch and easy chart on Galaxy Note 4? How to use Samsung keyboard? How to use Galaxy Note 4 side key panel? How to enable and access Galaxy Note 4 air command? How to customize Galaxy Note 4 notification tone? How to solve battery issues after ICS update in your Galaxy Note? If you are a user of Samsung Galaxy Note, or Note II, you will find the S Note in Samsung Galaxy Note 3 is quite different from that in Note or Note II. For example, a lot of seasoned S Note users will ask “where is the productivity tools?” in Note 3. In this post, I will share with you the top 10 new features of S Note in Samsung Galaxy Note 3. These include select and transform (replacing and enhancing productivity tools in old S Note), select and format (formatting your S Note), easy chart, line eraser, searchable S Note, full screen by default, landscape template, preview S Note, default template and default cover, and add from scrapbook. Please note, Samsung Galaxy Note 10.1 2014 edition has almost identical S Note as that in Galaxy Note 3. So this post also applies to Galaxy Note 10.1 2014 edition, although I just mention Note 3 in the post. Productivity tools is one of the most welcomed features in S Note. It is powerful and east to use. If you are not sure about the productivity tools in previous generations of Galaxy Note devices (Galaxy Note, Galaxy Note II, Galaxy Note 8.0, and Galaxy Note 10.1), you may check this video. Once you get the new Galaxy Note 3, you will find you can not find productivity tools in the new S Note. Quite a lot Galaxy Note 3 owners asked me where to find the productivity tools. In Samsung Galaxy Note 3, the productivity tools are deeply integrated into S Note. The term is no longer used for the new S Note. This is our second S Note video tutorial. In this tutorial,we will learn how to change the appearance or typesetting of your text in S Note. This includes font type, text size, text decoration, paragraph spacing, paragraph alignment, paragraph indent, pre-defined styles, and list styles. This tutorials works on Galaxy Note, Galaxy Note 2, Galaxy Note 10.1 and Galaxy Note 8.0. Of course, this covers both typed (from keyboard) text, and handwriting recognition text (from Productivity tools). If you are not sure about productivity tools, you may check this post (https://www.allaboutgalaxynote.com/s-note-tutorial-how-to-use-productivity-tools/ ). The transcript is attached below the video for your convenience. If you have questions, please post in comments section below, or start a new thread in discussion forum. More tutorials for S Note app can be found here in the S Note guide page. More tips on Galaxy Note, Galaxy Note 2, Galaxy Note 3, Galaxy Note 8.0 and Galaxy Note 10.1 can be found in Tips and Tricks page. Galaxy Note 3 online manual (HTML edition) is available here. If you want to download the PDF version of Galaxy Note 3, Note Ii, Note 8.0. Note 10.1, or read the PDF version on line, you can find all of them in this User Manual page. Hello guys, this is the second S Note video tutorial from AllAboutGalaxyNote.com.For more tutorials and update, please visit our blog at: AllAboutGalaxyNote.com. The S Note Survival Guide e-book will be available in January 2014! 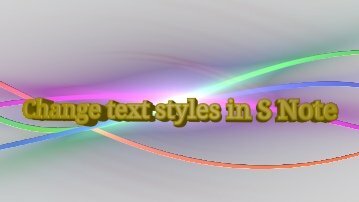 Today we will learn how to change the appearance or typesetting of your text in S Note. This includes font type, text size, text decoration, paragraph spacing, paragraph alignment, paragraph indent, pre-defined styles, and list styles. This tutorial applies to S Note on all Galaxy Note series devices, including Galaxy Note, Galaxy Note 2, Galaxy Note 10.1. Font settings can be accessed by long tapping Text button. And you can put this font setting window on the screen when typing or writing text. This is very handy if you want to change font settings quite often. How To Use Galaxy S10 LED View Cover (Galaxy S10 LED Wallet Cover)? How to take screenshots on Galaxy S10 without using any apps? How to hide Bixby home from Galaxy S10 Home Screen? How to use Galaxy S10 Settings? How to use Bixby quick commands on Galaxy S9, S9+, S8, S8+, Note 8, and Note 9 with the Android Pie update? How to remap Bixby button on Galaxy S9 and S9+ after updating to Android Pie? How to use the updated camera app in Android Pie update for Galaxy S9 and S9 Plus? How to use the rotation toggle to change and lock screen orientation in Android Pie update for Galaxy S9 and S9 Plus? How to lock Galaxy S9 home screen layout on Galaxy S9 and S9+ with Android Pie update? How to use the floating keyboard on Galaxy S9 and S9+ with Android Pie update? How to use the new Recents screen in Android Pie update for Galaxy S9 and S9 Plus? How to use the lift to wake feature on Galaxy S9 and S9+ with Android Pie update? How to update Galaxy S9 or S9 Plus to Android Pie (Android 9)? How to use the night mode on Galaxy S9 and S9+ with Android Pie update? What is active noise cancelling (ANC)? How active noise cancelling headphone works? What are the differences among in-ear, on-ear and over-ear headphones? How to connect Google Home to a Bluetooth speaker? How to adjust the equalizer (EQ) of Google Home, Google Home Mini and Google Home Max? How to use touch control for Google Home Mini? How to adjust alarm volume and timer volume in Google Home, Google Home Mini and Google Home Max? How to reset Google Home Mini? How to use Google Home as a Bluetooth speaker? How to use the screenshot shortcut to take a screenshot on Android Pie? How to use the Android Pie navigation gestures? How to use smart text selection in Android Oreo? How to play Android Oreo Easter egg game? How to use and manage notification channels in Android Oreo? How to use notification snooze in Android Oreo? How to use notification dots (notification badges) in Android Oreo? How to use picture-in-picture (PIP) mode in Android Oreo 8.0 and 8.1? How to use the new features in Android Pie update for Galaxy S8 and S8+? How to use app shortcuts in Galaxy S8 Home screen in Android Oreo update for Galaxy S8 and S8+? How to Install Galaxy S8 Android Oreo Update for Galaxy S8 and S8+? How to enter Galaxy S5 recovery mode? What are the differences: Moto G6 vs Moto G6 Plus vs Moto G6 Play (Moto G 2018)? How to install Moto G5 SIM card? What’s new in Android Marshmallow update for Moto X (Moto X 2014, Moto X Style and Moto X Pure edition)? How to use alarm and customize alarm tones on Moto E, Moto G and Moto X? How to install Google Play Store on Amazon Fire Tablet: Fire 6, Fire 7, Fire HD 8 and Fire HD 10? How to setup a Google account on Amazon Fire tablet? How to enable and access developer options on Amazon Fire tablet (Fire HD, Fire HDX and Kindle Fire HDX), and how to hide developer options again? What’s new in Chromecast 2018 (3rd gen of Chromecast)? How to use VLC media player on PC to stream music and video to Chromecast and Chromecast Audio? How to use VLC for Android to stream local media to Chromecast? How to use Galaxy S7 blue light filter in Galaxy S7 and Galaxy S7 edge Android Nougat update? How to use Galaxy S7 multi window new features in Android Nougat udpate for Galaxy S7 and Galaxy S7 edge? How to clear number badge in Galaxy S7 and S7 edge with Android Nougat update? How to customize Galaxy S7 quick setting buttons after Android Nougat update? How to show brightness control above notification panel in Android Nougat update for Galaxy S7 and Galaxy S7 edge? How to convert a foreign driving license to a Singapore driving license? How to get a Touch ‘n Go card as a Singapore driver? What is covered in the car warranty in Singapore? What is not? What is the Singapore Road Speed Limit? How to register, collect and use Malaysia Vehicle Entry Permit (VEP)? Why are cars in Singapore are so expensive? How to create a 404 page? Disclaimer: Samsung, Galaxy, Galaxy Note are trademarks of Samsung . This website is NOT affiliated with Samsung in any way. All the information provided on this website is provided on an "as is" and "as available" basis and you agree that you use such information entirely at your own risk.